Wednesday night the Pittsburgh Penguins and New York Islanders will get kick off their 2019 postseason play. The Islanders have home-ice advantage and depending on who you talk to they have an advantage defensively and with their goaltending. The ‘”problem” with great goaltending is that it can hide what is actually happening and spawn false narratives about a team and their coach’s ability. If you take a look at the 82 game sample for the Islanders they are middle of the road suppressing the other team’s offensive push. When you look at the last 25 games not only are they not good, they are near the bottom of the league. This is problematic because the Penguins can generate. Barry Trotz’s “system” this year was elite goaltending. It isn’t going to stop the Penguins from getting their looks. Especially with how things are trending. 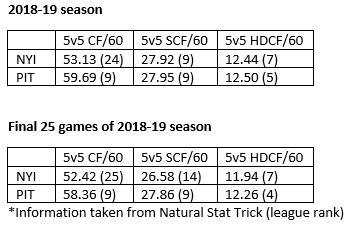 When you look at the Penguins defensive numbers they compare very favorably to what is talked about as a “strength” for the Islanders. Just look at the scoring chance and high-danger chance suppression the Penguins have had the last 25 games of the season. They are top five. It is legitimately an area of strength for the Islanders. 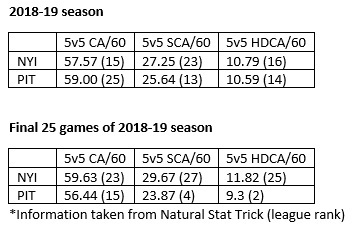 The problem is it is also quite the strength for the Pittsburgh Penguins with Matt Murray having an excellent season since coming back from injury. If the Islanders strengths are goaltending and defense and the Penguins are just as good, if not better, at both of them then what can the Islanders hang their hat on? In the scoring chance and high-danger attempts at 5v5 the Islanders compare favorably to the Penguins. Something I don’t think a lot of people would assume. The Islanders are trying the old quality over quantity approach. They aren’t going to overwhelm the Penguins with waves of attempts. They are going to try and strike in transition. When thinking about the rosters you might think the Penguins would have a big shooting percentage advantage. This series isn’t going to come down to if the Islanders can defend, because that really hasn’t been a strength for them. 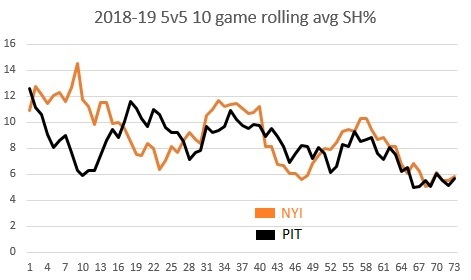 It is going to be if the Islanders can find their shooting percentage groove from earlier in the year and trade transition chances with the Penguins. The Penguins shouldn’t have a problem generating a quantity of shot-attempts. Their key will be to not get too greedy and feed the Islanders transition. The discipline of the third forward staying high will be key. If Penguins neuter the Islanders transition they are left with pretty much nothing. They did not show an ability to generate quantity over the course of the season. All in all I think this matchup is favorable for the Penguins. Their high end talent is better and the goaltending which was a major strength for the Islanders is a wash. I don’t believe the Islanders defend nearly well enough and I think it will be an uphill climb for them against a Penguins team playing their best hockey of the season heading into the playoffs. Tomorrow we will talk about line matching and lineup decisions. On the latest Hockey Hurts Podcast we decided to take a crack at picking opponents for the top seeds. I still believe allowing the teams to choose rewards those who do the best in the regular season the most. You have a chance to vote on the hypothetical playoff series and who you think would win. We eliminated conferences and used overall standings points and seeded the teams 1-16 before we made the selections. Some interesting matchups. On this podcast we seeded the 16 eligible playoff teams 1-16 by standings points and then picked the opponents for the top seeds.